Type the command or write it on a batch file. 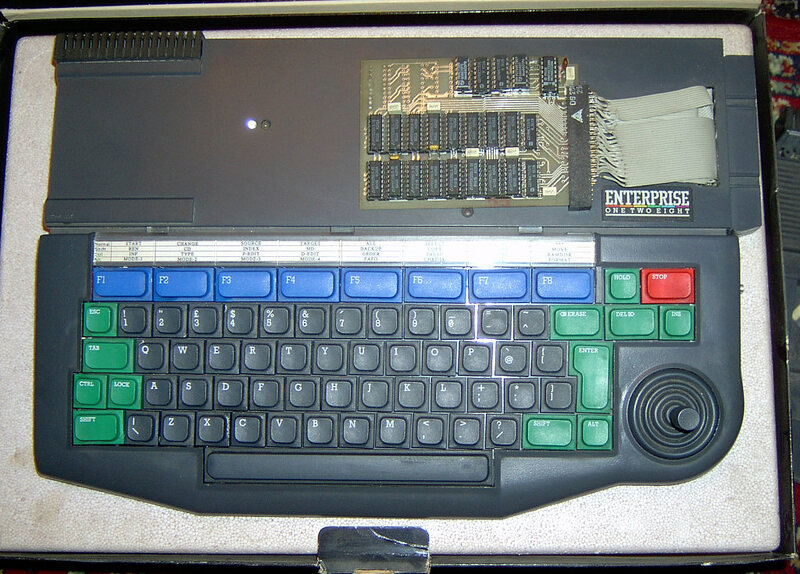 You see, there was already available an EXDOS card with 512kB memory expansion in '88. 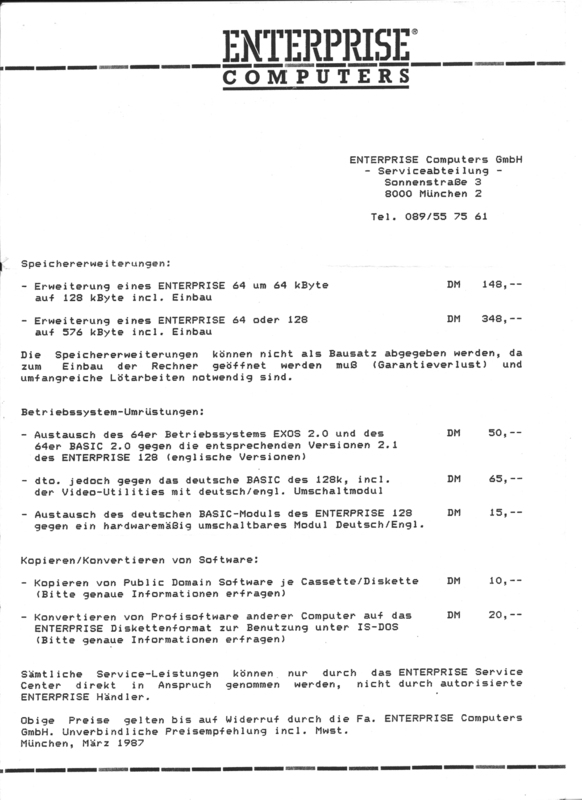 Also available the internal 512K expansion from Bugtronics (Netherland), the German company released a Enterprise 576K with this expansion. In Hungary also exist clone of this card, produced by Tibor Kulcsár and Tibor Koch. 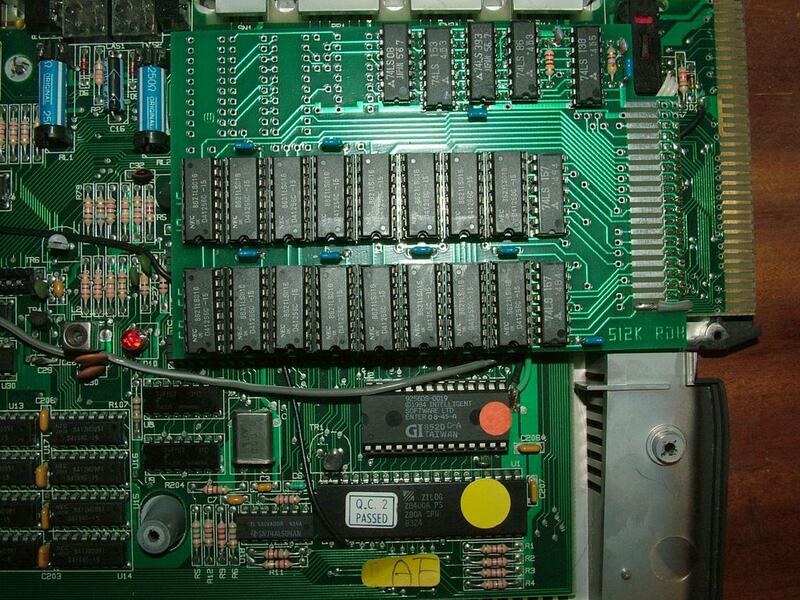 I added to my machine but also keept the original 64K expansion Then I have 128K + 512K with this card, 512K on MICROTEAM EXDOS, + 2x 64K +1x 32K on other expansions = 1312K config. All these at the old good days. Thanks for the link to the EXDOS manual gflorez! I have been able to test in in ep128emu now! What is even better, this very nice emulator allowed me to actually use my real physical USB 1.44mb diskdrive in the emulator, I didn't know this before. Anyway, then I created a RAM-disk, copied all the files to that and ran from it, no skipping in the sound at all. Yes, the ep128emu read whole track to cache. Better give thanks to Zozo, the manual is on his personal web page. Click the link under his nick to found a lot more information. Check EXOS variable 3 (DEF_TYPE) with EXOS 16 function call. -If it is 0 then tape only configuration, disable loading music. -If not 0 then EXDOS used or ep28emu FILE device. -If not exist, then non EXDOS configuration, ep128emu FILE device used, enable loading music. -If it is 5, already running from RAMDISK, enable loading music. -If it is 6 or more then SD or hard disk used, enable loading music. 1)check memory size with EXOS 20. It is enough for running the program plus enough RAMDISK size? Thanks for the suggestions Zozosoft! Though I think that adding an option to disable music will not make much sense. It's not like it's a separate loading music, it's the main music that will play through the entire demo. If I were to stop calling the music player while loading, it will be out of sync totally anyway on slow loading systems when the next part starts (for example, if I want to load 10240 bytes, it will take 20 frames x 512 bytes. If I don't call the music player those 20 times while loading, it will be off by almost half a second when the next part starts). Perhaps I could modify the music replayer to have an option to keep calling it the correct number of times while loading, but not outputting at all to the sound registers and have silence). I don't think that would be good either, since my plan is to really have a high data flow, say 10-20 seconds of effect that can use the entire memory, then it's time to load 25-30kb of new packed code/data which will take a couple of seconds with my 512 byte/frame loader, and then the next effect and so on. With a slow loader then it would be 10-20 seconds of effect and music, then maybe 10-20 seconds (with disk, I guess) or minutes even (with tape) with silence while the slow disk loader is loading, and then music resumes. It would not be a good experience either way. * If tape only or drive number 1-4 => Show warning "Demo will not work properly" - but let the viewer see it anyway, with crappy slow "music" (ie. notes that last several seconds...) while loading. * If emu or 5/6 => Start demo as usual, no warning shown. So for users with RAMDISK, it's up to them to copy the demo into it before starting the demo. The truth is that I think most people will only watch the demo on YouTube, a few will use ep128emu and some real enthusiasts will use real Enterprise 128, but I think most of them will have either SD card or RAM expansion available! A separate EXDOS.INI starter can be made for RAMDISK users, which will create the RAMDISK, copy everything ans start the semo. Probably it could be the following 3 rows. Creating the RAMDISK and copying the files can also be in the program itself, as Zozosoft suggested.